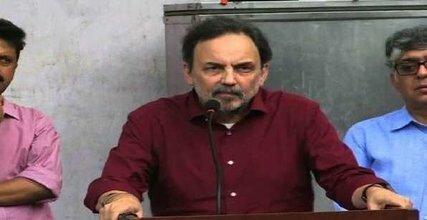 It is categorical that the raids at Roys house and other locations were definitely meant to target them and harass them because in the huge spectrum of media today in India, NDTV remained for whatever reasons, the only channel which did not succumb to the pressure of following the line of BJP but definitely that does not make it a channel of pro social justice who respect diversity. Fact of the matter is that NDTV and its promoters have always enjoyed the proximity to power even when they maintained their ‘elitism’ and most of the anchors and journalists in the channel were not ‘aam admi’ but the bachchas of ‘khas’ bureaucrats who would definitely be more ‘secular’ in their approach than rustic ‘Hindi’ wallahs. While NDTV remained better than other megaphones at the moment, it is not true that it has not ‘toed’ the BJP line. Those of us who have been observing media regularly know well that Pronnoy Roy and his team are good managers in ‘balancing’ but with Modi ascendency at the Race Course Road, it was difficult for all the members of NDTV to have the same support as they enjoyed under the Congress. It is a fact that Narendra Modi does not forget things that easily and he has not forgiven all those who tried to bring truth from Gujarat. NDTV’s Gujarat coverage definitely resulted in ‘creating’ more problems for Modi and BJP so after coming to power he did not ‘condone’ any of those ‘secular’ journalists who reported about the killings of Muslims or discrimination against them. Fact is that in terms of TRP, NDTV continue to be lagging behind channels started by some of its own staff but what is important about the channel is that it remained a favourite of ‘elites’ in India. It does not matter whether the channel has bigger TRP than Times now or India Today or now Republic but it was clear that ‘liberal’ brahmanical elite love to be associated with it in the name of ‘secularism’, quite similar to that of the JNU tradition which is considered to be ‘domain’ of ‘liberals’ though most of them have not been able to shed their own caste biases. Post 1990s, the things have changed very well. Media though remained brahmanical yet also corporatized and hence the value system also changed. It was the generation of those happy looking ‘upper castes’ who were very ‘disturbed’ with V P Singh government’s decision to provide 27% reservation for Socially and Educationally backward Communities, termed as OBCs. In fact, Narasimha Rao is widely hailed as great man despite all known fact of how corrupted India’s political system as well as responsible for demolition of Babari mosque on December 6th, 1992, because he opened up India’s economy and virtually eliminated all the possible ways of the entry of Dalits OBCs in the government services. Today, it is a well-known fact that most of the media in India is being run by not just corporate houses but many have been groomed under political and sarkari patronage. The fact is that most of the channels will close down if they stop receiving these funds. NDTV was expert of it during the Congress regime but it did not leave its elitism and hence it remained the first choice of the bureaucrats, authors, business tycoons as well as ‘Anglicized’ ministers of the UPA but with the change in the government, it has not merely lost its privileges to others in the business who did not hide their preference for Modi and ready to sing a song for him any point of time. Modi and most of his ministers have no understanding of the brahmanical elitism as they have been trained in the Sangh Shakhas with their absolutely rustic and most of the time idiotic explanations of things which reflect what have they been taught in these institutions’. Beyond Hindi Hindu Hindustan they know nothing and that create problems for them. The elitist media would not defend their idiocies but now they have Public Relation Media which has crawled completely hence it is licking but as far as NDTV is concern, it does not lick but it can never claim to fight against them, it cleverly ‘maintained’ an image of ‘liberal secular’ channel. Ofcourse, it must be appreciated for not succumbing to broadcast the speeches and lectures of the ‘spiritual gurus’ or their ‘mind blowing’ ‘bhut pret’ stories though Patanjali products of Ram Dev and Pay Tm which was the biggest beneficiary of Modi’s demonetization drive, were the biggest advertisers of NDTV. Many people are suggesting that NDTV is the least watched channel at the moment. Yes, accordingly the most watched is India TV and its Bhut-Pret stories which compelled others to follow the same. Now, it is the agenda of the power to push all this in the name of ‘bharatiya sanskriti’. Problem is not with your TRP as it depends on who are your ‘clients’. In 1984 when Rajiv Gandhi’s government sent Income Tax officials raiding the Indian Express, the condition was worst. There were so many charges against them. Most of the people wrote that Express was not the leading daily. It does not matter because what matter is the ‘clientele’ and Indian Express was a leader in it. It was a voice of the opposition party and took on Congress government. It was always known for that. NDTV on the other hand has carefully built its image of an elite institution and therefore even if its circulation or TRP is lower, its impact and being there still matter. Second, whatever the other channel are, Roy remain doyen of electronic media, a guru for all hence his influence is still strong and powerful. Most of the Indian media is engaged in self-censorship and therefore has lost the faith of India’s huge Bahujan masses including its minorities. There is only a difference of ‘degree’ the way they report. Some are unabashedly communal while other pretends to be ‘secular’. In fact, all of them have deep problems with the independent voices from the marginalised sections. All of them have in their heart of heart derision for social justice and issue of representation of India’s marginalised in the power structure. The Press Club saw a huge gathering in support of the NDTV. In the galaxy of the speakers were M/s Arun Shourie, Fali Nariman, H K Dua, Pronnoy Roy, S Nihal Singh and Kuldeep Nayyar. Three speeches of Nariman, Roy and Shourie made their way to social media. Suddenly Arun Shourie became a voice of ‘liberal’ ‘freedom loving’ journalist as his jibes against Modi and Vankaiah Naidu made very one laugh but the fact is that itself is an elitism which Shourie had always believed in. Many friends have been writing that they find nothing wrong in Arun Shourie speaking for them as it is the cause which is more important but we have to be careful enough whether the people like Arun Shourie really believed in freedom to expression or not. Whatever Mr Arun Shourie speak today, he definitely not a person defending freedom of writers and rights of the marginalised and minorities who are the biggest target of attack of the Hindutva forces encouraged by the ruling dispensation. In 1989 Indian Express’s employees including working journalists fought for their legitimate right of increasing their wages as per the Bachchawat Commission Report but the owners refused. Arun Shourie, the editor, never stood with his employees but attempted everything to divide the workers but failed. For nearly one and a half months the Delhi edition of the paper was shut. In 1990, the government of the day accepted the implementation of Mandal Commission Report which at the first point meant that 27% reservation for backward communities would be provided in the central government jobs. Arun Shourie forgot all his ‘journalistic’ ethics and launched a vicious campaign of calumny and hatred against the then prime minister Mr V P Singh who had actually honored him with Padma Bhushan along with N Ram and Nikhil Chakravarty. In fact, Nikhil Da refused to accept the award saying that journalists should remain independent and should not accept any government patronage but Shourie enjoyed everything. When V P Singh was negotiating with both the Hindu and Muslim organisations for an amicable solution to Ayodhya situation, Arun Shourie attempted to douse the flame further by discrediting Singh suggesting that V P Singh himself wanted the Masjid to be demolished. In fact, Ramnath Goenka did not take that lightly and Arun Shourie was dismissed rather unceremoniously from the Indian Express. If there is any history of making a brand of an individual through your editorial position, it was Arun Shourie, who became hero of middle classes. In fact, if people like Arnab Goswami have a fan following it is because they have understood the ‘power’ of TRP does not come simply because you are a great orator or writer but because your ideas and formulations are suiting well to the power communities. Arun Shourie provided that confidence to ‘Hindu upper castes’ not to feel apologetic of the ‘caste system’ as he launched his vicious anti Dalit propaganda in the form of ‘Worshipping the False God’ where he showed his hatred towards Dr Ambedkar. He mocked at his statues and questioning of Gandhi and termed him as an ‘agent’ of British who was dividing the freedom movement. Shourie did not end with opposing reservation or working classes, he continued with his anti-minority stand, first targeted Muslims and then Christians. He did not have time to speak up against the demolition of Babri Mosque, in fact much has been written about him as how he justified demolition of Mosque as well as killings of Muslims in the aftermath of 2002 riots. It is clear that Shourie was eyeing for the Finance Ministry under Modi but Modi needed the other Arun who could provide him ‘legal’ advice on time to time. Much before anyone could speak about Modi, it was Arun Shourie who declared him ideal candidate for being Prime Minister. Despite all criticism, Arun Shourie remained darling of India’s middle classes ‘liberals’ too which clearly shows that at ‘certain’ point of time, when the common interest meet, there is little difference between these Hindu ‘liberals’ and the Hindu ‘right’. One has to understand that merely speaking against BJP and Narendra Modi does not make one a secular liberal democratic fighter. Freedom of Expression and media is under the threat not because NDTV was targeted but because everyone who stood against this tyranny is being targeted. NDTV can find numerous friends and supporters but not the common people who write on social media, on small local papers and magazines. We also have to understand that the merging of ‘interest’ of the ‘intellectual elite’ does not happen because you are left or right but how Anglican you are in your language as well as ‘champions’ of ‘laissez-faire’ or what we call as open market economy. Most of these ‘liberals’ have serious difficulties in dealing with the issue of social justice and therefore their clash with the government has not much to do with your freedom but more to do with ‘fixing’ their own ‘problem’ which are related to their business, most of the time. But as many of our friends have written and expressed their opinion that it is time to join hands also which does not mean agreeing on everything or condoning your past. Nor is Arun Shourie going to apologise for what he wrote about Muslims, Christians and Dr Ambedkar or against the OBCs. In fact, he recently spoke the two ‘biggest’ mistakes of his life. One was ‘supporting’ V P Singh and second to Narendra Modi. Arun Shourie was a ‘devotee’ of V P Singh who became his arch enemy after the Mandal report and behaved like wounded tiger. It is also true that media remain as divided as ever on the issue as most of the media has turned into big profit making corporation which can not operate without the support of power hence you can’t expect too much from them. But let us not forget that freedom of expression, right to your political thoughts are the issues much bigger and should be looked in a different way than merely fixing up NDTV’s problems. We will have to understand to the working pattern of the authorities today which is not merely intimidation of dissenters but also systematic vilification. They selectively leak information and then we watch a media trial. Now, beyond the media trial we have the fake news which is actually a well-established mechanism by the religious rights who dish you everyday hundreds of cooked and concocted stories which is basically your character assassination. Hence, these news and ‘break-news’ can’t be trusted that easily as behind them is an agenda. Best thing for the government or its authorities is to carry out their work without handing over the selective leakage to ‘friendly’ reporters for a ‘break-news’ to be discussed in your drawing room as ‘exclusive’. These things are dangerous and must be resisted. None is above law but then it has to follow the due process and without any prejudices. At the time when all the organs of the government have virtually failed and are flirting openly with Hindutva, it would be difficult to accept them unbiased against those who consider detrimental to their ideological perceptive. As I said government knows well ‘kaun kitne paani me hai’, corporate media and government need each other. Let the government form a commission to inquire into all that is dirty and rubbish in the media Industry? Can it do so? If yes, then all the ‘bhut pret’ channels would have to be closed as they don’t meet any international or national standards of news without prejudices. Will those who are speaking like ‘let the law take its course’, agree to such an idea to weed out the dirt? Even when I firmly believe that free media in India is a myth, it is time to protect whatever little spaces that exists and that we have. Though with the boom of internet and social media the best thing has happened is that we are not depended on mainstream manuwadi media for information yet it will take time unless we are able to develop an alternative media. India is a huge country and therefore we have to depend on diverse sources for information including the same channels and papers which we accuse of being manuwadis because we do not have that capacity at the moment to have our own media. It is also important for us to show to these mainstream media that unlike them, we stand for their so called freedom even when we disagree with the contents they are pushing our throats in the name of ‘people’s choice’. Therefore, at the moment we would only say that we may differ with people and their organisations but it is time to stand united and fight any attempt to gauge your political thought and right to freedom of expression. NDTV is the direct target but things are more serious and we need to understand the pattern in it hence whether we agree or not, whether we fight together or wage a different battle, it is time to remain alert and oppose all forms of attempt to suppress or intimidate all those who do not follow the one idea of India that the Hindutva forces want to impose upon us. RSS Controlled Garbh Vigyan Sanskar in pursuit for "Master Race"